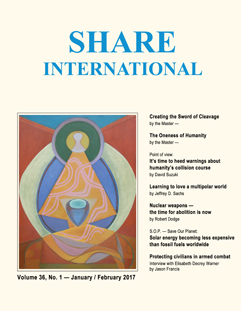 Since the inception of Share International magazine, Benjamin Creme's Master has provided articles to be published not only at the time they were written, but also whenever appropriate according to world circumstances. Indeed, many of these articles seem more relevant now than when they were first published. In the following article the Master shows how commercialization has impacted the health of the planet and that of humanity. He issues a warning about the time we have left to restore balance. As if He were writing today, He points to the growing public awareness of the need to change in order to save the planet and the millions of dispossessed. More and more, men are beginning to understand the severity of the problems which face them today. On all fronts – political, economic and social – these problems multiply and cause much heartache and sad shaking of heads. Add to these the environmental problems which man's cavalier attitude to nature and its resources has engendered, and the future for mankind looks bleaker still. The realization is dawning that mankind's life is in crisis and that something radical must be done before it is too late. The time is soon coming when men will realize that the most important problem facing this generation is the ecological imbalance which threatens vast areas of Earth. As you know, men are divided as to the extent of this problem but unless their attention is squarely fixed on this ecological dilemma, the future for many is under question. Soon many groups will realize the full import of this danger and that, year by year, little separates them from disaster. The forces unleashed by global warming are now well beyond the control devices available to men. Hearken, therefore, while there is still a little time. For the waters rise inexorably, and men gamble, blithely, with their future. S.O.P. – Save Our Planet. The following questions and answers, first published a number of years ago, may provide insight into current concerns. We have chosen them because of their current relevance. Q. On 29 October 2012 Hurricane Sandy made landfall on the east coast of the United States, causing death and much destruction. (1) Was this storm the result of (a) global warming (b) man's destructive thought patterns and/or (c) karma? (2) If karma played a part, may I ask for what exactly? Hurricane Gilbert, which devastated Jamaica and the Cayman Islands, made its way up the Yucatan peninsula in the Gulf of Mexico on 14 September 1988 and was heading towards Texas. It is the worst hurricane ever recorded, with wind speeds of up to 185-200 miles an hour. The fact that it was heading towards Texas has a deep significance. Texas is one of the richest parts of the USA. In crises, people will be brought closer together and will help each other. Q. Let's suppose that Declaration Day is delayed for a while and that the world finds itself in crisis, on the brink of a nuclear war – would Sanat Kumara, the Lord of the World, and Hierarchy allow the planet to be destroyed? Q. Is it true that Sanat Kumara is directly involved in the nuclear issue? A. Yes. Since the secret for the creation of the atomic bomb was released by Hierarchy to the allied scientists during the war from 1939 to 1945, Sanat Kumara is now directly involved in any use of nuclear weapons and, I believe, would not allow such a catastrophe. Share International has a very large reserve of 'Letters to the Editor' which have been processed over the years, confirmed to be genuine, but not yet published. Some of the Masters, in particular Maitreya and the Master Jesus, appeared at Benjamin Creme's lectures and Transmission Meditations. They also appear in different guises. If the experiences were authenticated by Benjamin Creme's Master, the letters are published. These experiences are given to inspire, guide or teach, often to heal and uplift. They also draw attention in an amusing way to some fixed intolerance to, for example, smoking or drinking. At times the Masters act as saving 'angels' in accidents, during wartime, earthquakes and other disasters. They use a 'familiar', a thoughtform, who seems totally real, and through whom the Master's thoughts can be expressed. They can appear as a man, a woman, a child, at will. Occasionally They use the 'blueprint' of a real person, but in most cases the 'familiar' is an entirely new creation. I cannot forget. During November 2000, in Toulouse, I was working at the French Family Federation office. As I was searching for the dustbin place, I met a beautiful woman. She was wearing all white clothes. Her hair was very black, her smile very nice and her appearance really perfect. When I got into the office, I suddenly realized that I must have a word with her, but she had disappeared. I thought, maybe she was waiting for a child in the school nearby. Her smile and her appearance are still sometimes in my memory, even after 17 years. The following two letters are from witnesses to 'the tall man in a turban' seen at the US Transmission Meditation Conference on 15 July 2017, and also described in two letters entitled 'Fleeting glimpses' in the September 2017 issue of Share International. The theme of our 2017 annual Transmission Meditation Conference in San Francisco was 'Group Fusion, Looking Back and Moving Forward'. The group focused on a compilation of inspiring talks by Benjamin Creme and the four requirements necessary for achieving group initiation. Our small group discussions took place in various buildings around the campus. At that time during our sharing of reflections on the theme, I noticed through the window a tall handsome man walking past our building. He wore jeans, a multi-colored shirt, sunglasses, and a striking light purple turban. There were also deer meandering alongside the buildings. It was such a lovely sight; it made me smile and filled me with joy. I wondered if this beautiful man could be Maitreya. Throughout the conference, Maitreya's loving energies were so extraordinary. Later in the day I learned that a co-worker from another small group in another building had had a similar experience! During our recent Transmission Meditation Conference in San Francisco, we had divided our large assembly into smaller groups for more intimate discussions. I found myself with a small group of co-workers in a side room called 'The Owl's Nest' – a location that had served as an office for Benjamin Creme in earlier years and which contained one window to the right of me and one straight ahead from where I was sitting. As a co-worker was talking, I was pondering on the conference theme, 'Group Fusion', and casually glanced out the window to my right. At that moment, a Sikh man suddenly strolled past. He was adorned in a beautiful lilac-coloured turban, a matching lilac plaid shirt, sunglasses and jeans. I had never before seen a turban of this colour and thought that it was such an oddly feminine colour to be dressed in, yet he was still very masculine. He walked at a leisurely pace towards the main sidewalk that cuts across the campus. I sat in complete astonishment as the words came clearly to mind, "I think that could be Maitreya." I sat in conflict, and not wanting to abandon my group, but there was an undeniable urge to follow him. I got up and quickly exited the room to search for him, yet he was surprisingly so far down the path that I only caught a final glimpse of him before he disappeared around a corner towards the ocean beach. I wanted to run after him but there was still a doubt that I could just end up stalking a stranger and if it was Maitreya, what would I do once I'd caught up with him? I decided to go back to my group but I really was consumed by my own thoughts of this experience I had just witnessed. I returned to the room and sat down again in my chair, looked to my right out the window again, and there was a family of baby bunnies playing in the grass. I then looked out the other window straight ahead and there were fawns and deer performing before me. I watched them frolic and run down the same way the man had gone. It was a surreal experience and I sat in silence and awe for the remainder of my group session. I later found out that another co-worker at a different room in the campus had seen the man and had also seen the deer following him. In 1999 I was on a short working trip to Jersey. As I settled into my hotel room I reflected on recent happenings in my life. After a few difficult weeks I was ready to move forward but I wasn't sure where I wanted to go. I said: "Maitreya, I don't know where my life is going at the moment. I need your help, but I know it's up to me to sort out my life." I turned on the television and the news was on. I attempted to turn up the volume and I assumed I had pressed the wrong button as the screen changed and the picture rolled and flickered and jumped around. When it settled down I had a perfect picture of Benjamin Creme talking about Maitreya. I thought, "that was lucky" and sat down to watch; my existential crisis was forgotten. It was an interview in Benjamin's own home and he spoke about the emergence of Maitreya and the Masters of Wisdom with his usual charisma and ease. I had heard his talk on many occasions and it always sounded new and fresh. He also talked about Transmission Meditation and it showed the group in action. When the camera zoomed in on individual faces I thought they looked almost angelic! A few months later I was on the phone to Gill at the Share International office. I mentioned the programme and was surprised that she had no knowledge of it. She thought that perhaps it was a very short piece on a cable channel. I said it was a detailed programme which lasted possibly one hour. Some months later I was back in the same hotel in Jersey. I checked the television and found only the four or five terrestrial channels. I asked the hotel staff and they said there was no cable television in the hotel. I relayed this to Gill when we next spoke. She decided to tell the story to Benjamin Creme who checked it with his Master. The Master said: "Maitreya put on the programme for her and no one else saw it. She had a private viewing in her room." He also said to invite her to join the Transmission Meditation group. Benjamin let me know that it was my decision, but I "would be well advised to take up the offer". If there is a moral to this story perhaps it is: be selective about your television viewing! In March 2002 I took a trip to India. I was waiting at the train station to catch the train from Nippori Station to Narita airport. At last when the train arrived I jumped on and searching for an empty seat noticed a vacant one near the entrance of the carriage. It was a window seat next to a middle-aged man; a foreigner in his late 40s or early 50s. As I sat down he struck up a conversation. He said he really liked Japan and was here on business. He eagerly began to show me his guidebook on Japan, pointing out the various places he had visited. The conversation carried on and he introduced himself as French, the father of two daughters, but divorced so without a wife. He then asked me where I was going and as I answered, he gravely replied that he too had been to India when he was young and thought it to be a very "difficult" place. Suddenly my eye caught something it had missed before. I noticed this man was using an entrance ticket to a famous Japanese temple by the name of Hasedera, as a bookmark. I enthusiastically commented that I myself had visited Hasedera last year and liked it a lot, thought it to be very spiritual. He agreed simply. I continued to ask him if he had been to any other temples. He answered, but mentioned a temple I was unfamiliar with. Yet he noted that he had gone there to meditate and pray and instantly my mind began to wonder if the man might be Maitreya or one of the Masters. I reached into my bag to show him a copy of an English Emergence Quarterly I had with me but taking a quick glance at it he returned it to me without response. When we reached the airport we got off and walked together to the terminal. As we were both headed for different destinations we agreed to meet on the other side of the ticket counter, after we had finished our various duties. Yet just after we were separating he said something surprising. "There are Americans. There are Russians. There are Japanese, there are many people. It is very difficult but it is the heart that is important." Repeating this several times he walked off to the Air France counter and then I lost him in the crowd of people. Could this man have been Maitreya or one of the Masters? Two weeks ago [Spring 2002] I was taking the last walk of the day with our dog. Because it was very cold and also raining I was very angry about the weather and was wishing spring to come soon. After 5 minutes I was dripping wet, and so was the dog. Suddenly I saw two people on bikes in front of me, about 200 meters away. Because it was very dark and the path narrow, I stopped and pulled the dog near to me to make way. The dog got nervous seeing the two bikers and I drew him closer to me. When the first biker passed me he said in a somewhat funny kind of way: "Thank you!" He and his companion looked like Sri Lankans and it was the first man's accent that made the words "Thank you" sound funny. Also the way the men were dressed, raincoats with yellow stripes, was very comical. The whole scene was surreal. From this moment my bad mood was gone and I felt happy. For a brief moment I think I felt energy on my crown chakra. Was the first biker Maitreya and the second Master Jesus? Was it the energy of Maitreya or my soul's energy? Or both? My grandma was in hospital in March 2002. It was not for the first time that year and she was there because she broke her leg. She had a lot of pain and had to wait to be operated on, because it happened at a weekend. I was lost in thoughts when I left the hospital with my sister after a visit, and was very sad thinking of my grandma's pain and the way she was suffering. On the way to my car I looked back to the building and saw a man coming down a lighted pathway. He went very slowly and I got the impression that he had also a lot of pain. He had to stop several times and needed the wall next to him to keep his balance. He had tanned skin, was about 35 years old, and had dark brown hair and eyes. He wore pyjamas from the hospital and had no other clothes with him, even though it was very cold that day. Our eyes met and I started to smile at him. I said hello and saw that his lips answered. I pointed him out to my sister. She also said hello. A few steps later I looked back. The man was gone. On the whole length of the darkened pathway was no one. On 1 May 2017 at 6.20 pm, while I stood chatting to my wife in the kitchen, a prism/rainbow light appeared on the photograph of Maitreya's 'hand' that is on our fridge. The photograph has been there for over a year and nothing like this has ever happened before. I checked thoroughly for anything that might cause it, either inside or outside, and found nothing. I have also been checking sporadically to see if the same thing might happen at the same time again – but nothing. This seems to be a one-off. It lasted 5 to 10 minutes. It is sad that Benjamin Creme is not here to totally check; I suspect however he is with us. R.R., Los Angeles, California, USA. It was reported in August 2017 that a Pennsylvania couple claimed they saw the image of Jesus in an ultrasound of their unborn baby. The man they saw was dressed in a robe and was looking at their baby from the far left of the image. Bright blue and green flashing lights were seen during the 8.1 magnitude earthquake that struck Mexico's southern coast (September 2017). It was the most powerful earthquake to hit Mexico since 1985. Less than 100 deaths have been reported from the September 2017 tremor. A similar blue flash of light in the sky was seen during the 7.5 magnitude earthquake in Tokyo on 7 April 2011. Share International reported that "…Benjamin Creme's Master's information is that the light was, in fact, the result of spaceships from Mars counteracting the energy of the earthquake, causing it to 'implode'. This action prevented a catastrophic effect from the earthquake on Tokyo city, with a population of 13 million. This technique is apparently in a developing stage, and had not been used before in dealing with an earthquake of such magnitude. The result was held to be very successful and promising for future emergencies." Benjamin Creme's Master has confirmed on many occasions that authenticated crop formations are the work of the Space Brothers, mainly from the planets Mars and Venus. In the intricate patterns seen all over the world, especially in the UK, the crop is rarely damaged and, remarkably, the bent stems remain intact. This phenomenon has been well-documented by crop circle investigators. On 24 June 2017, a Share International co-worker visited a crop circle in Veaugues, Sancerre, France, that had appeared during the night of 1 June. He recorded evidence of the undamaged wheat stalks showing that all the plants were bent at the stem nodes, and that they continued to grow normally afterwards. We present a selection of quotations on the theme of 'The new politics'. The quotations are taken from Maitreya (Messages from Maitreya the Christ and Maitreya's Teachings – The Laws of Life), Benjamin Creme's Master (A Master Speaks Volumes One and Two), and Benjamin Creme's writings. Under the inspiration and guidance of Maitreya and His group of Masters, men will find an increasing ability to make the right decisions, to act correctly in relation to the Plan. This will lead inevitably to a growing sense of brotherhood, to an understanding that only as men move together can they forward move at all. When man approaches life from the inner, creative standpoint, Time will lose its hold over our minds and thus free us from its tyranny. All of this requires a new assessment of man's place in the Universe and the establishment of a truer rapport with the Source of our Being…. Poised as man is on the threshold of the New Age, it is essential to give some thought to the forms into which the present inadequate structures should grow. To ensure that the changes proceed in the desired direction of greater social justice and eventual brotherhood, we would do well to look closely at the means whereby these conditions may be achieved. It is obvious that the present structures no longer serve man's need for peace and co-operation on a national or international level; the opposite holds true. Were man to continue in the present mode, annihilation would be inevitable. Fortunately, there are those who see this and work for change. Structures are required which, at the same time, give the greatest freedom and tolerance to individual needs yet deny to the individual the right to exploit his brothers. While preserving the enterprising spirit of the talented individual, they must also ensure the rights of the community as a whole. Structures must be sought which take advantage of man's natural desire to participate in all that affects his life. This will make for greater social cohesion and sense of shared responsibility. The present political party systems are clearly inadequate to provide for this participation and must give way to other forms of representation. This holds as true for the Democratic West as for the Communistic East. Envisage a process whereby, more and more, each man or woman becomes engaged in the making of decisions on the level of community affairs. Calling on the untapped potential of millions, a transformation of social life can quickly take place in an orderly and responsible manner. Participation is the key-note, for only through such participation can each one identify with, and work whole-heartedly for, the communal goal. In this way, social and group responsibility will be inculcated; the present unhealthy, anti-social attitudes, born of a fragmented and unjust society, will fade away like mist before the heat of the sun. That some such process already exists in certain countries is true but as yet it is confined mainly to rural communities whose social structures are still relatively homogeneous. The task ahead will be to create conditions on a worldwide scale whereby all men will have a voice in creating the future society. Only thus will the present divisions be resolved. This is not as difficult as it might seem, for the key rests in man's hands. The key, as always, is the principle of sharing. Once implemented, this principle will remove the obstructions which prevent co-operation between different social and national groups and will thus prepare the way for more harmonious forms through which humanity can express itself. Leisure, available for the first time to millions, will provide the opportunity, hitherto denied them, for a close involvement in community and national life and organization. When men have the leisure to participate, they will find within themselves the answers to the problems which now beset them: the problems of sectarian hatred and division, of injustice and poverty, crime and war. Not all men will welcome, at first, the changes which must take place but, in growing numbers, they will come to see the wisdom of justice and shared responsibility, the only guarantee of harmony and peace, communal, national and international. Many now are active in their communities, seeking to impress their vision on society, and much of worth is taking place; but humanity awaits the key which will unlock the door of the future and assure them of new and fuller life – the divine principle of sharing. Pope Francis: "Solidarity must be concretely expressed at every stage of the migratory experience – from departure through journey to arrival and return." On 15 August, His Holiness Pope Francis issued a message at the Vatican, prior to his participation in the World Day of Migrants and Refugees on 14 January 2018. "I have repeatedly expressed my particular concern for the lamentable situation of many migrants and refugees fleeing from war, persecution, natural disasters and poverty.… When I instituted the new Dicastery for Promoting Integral Human Development, I wanted a particular section – under my personal direction for the time being – to express the Church's concern for migrants, displaced people, refugees and victims of human trafficking.… Solidarity must be concretely expressed at every stage of the migratory experience – from departure through journey to arrival and return. This is a great responsibility, which the Church intends to share with all believers and men and women of goodwill, who are called to respond to the many challenges of contemporary migration with generosity, promptness, wisdom and foresight, each according to their own abilities. In this regard, I wish to reaffirm that 'our shared response may be articulated by four verbs: to welcome, to protect, to promote and to integrate.'" The Pope continued: "More widespread programmes of welcome, already initiated in different places, seem to favour a personal encounter and allow for greater quality of service and increased guarantees of success." Building a society on "sustainability and sharing"
In an article called 'Why we need to stop war', musician and president of the UK's Stop the War Coalition, Brian Eno examines the reasons why war remains so dominant in our world today. He writes: "Stopping wars isn't something that happens when hostilities have already begun. It starts much earlier than that, in the very fabric of society. Our society is increasingly built around war – or the threat of war – and a lot of people have an interest in keeping things that way." Eno lists the interested parties in war as the ideologues, the weapons manufacturers, the science/technology industry of war, the media, the politicians and the 'security' business. He writes: "The truth is that the economies of both the US and the UK (and many other countries) have become so centred around military production that they have grown to need an on-going threat of war. America emerged from WWII as a very wealthy country, having learned that the people who really win wars are the people making the weapons." Broadly speaking societies can be held together in two ways: "One is through hope; the other is through fear. But for a society to be held together through hope there has to be a credible sense of promise in the future: a majority of people have to believe that things will get better.... You can't have a hopeful society if its élites prioritise aggressive foreign wars and 6 billion pound floating bombing platforms over social spending. You can't have a hopeful society focused on fighting aggressive foreign wars which in turn flood your shores with refugees. "So it's fear that keeps the hamster-wheel turning; but it's hope that will get us out of the cage. Stopping war means building a society based not on relentless consumption and profiteering but instead on sustainability and conservation and sharing. It means making a world that is worth saving for everybody, so that the idea of war – of destroying all that – becomes unthinkable, ridiculous. "It means breaking up those entrenched hierarchies that regularly produce over-privileged halfwits – con-artists who know how to talk but not how to think, and who exist in some eternal [private school] mind. Their unshakeable sense of natural superiority fosters a hubristic arrogance with which they ride into war after war, certain that they couldn't possibly be wrong. "And stopping war entails, perhaps beyond anything else, distributing the wealth of the planet so it doesn't automatically accrue in the hands of the already-powerful but instead is used to build a world where more people get better chances. We live in the wealthiest societies in history. The creativity and ingenuity and labour of generations of humans have produced enormous wealth. With that wealth properly deployed, a world of peace is more feasible than ever before.... Instead of making destructive wars, let's think how we make a creative peace. Instead of thinking how we get more as individuals, let's think how we can better share what we already have as a society. Instead of thinking that our role in life is to keep our heads down and be obedient shoppers, let's stand up straight and proud and create something new together." UN Secretary-General António Guterres was interviewed on 8 September 2017 about the role of the 72-year-old organization today. "I hope that young people will push their societies, their communities, their governments to understand that they need to have policies of social cohesion, they need to have policies that allow for everyone to feel that his or her identity is respected but, at the same time, that they belong to the community as a whole." Rabbi Lord Jonathan Sacks spoke at TED2017* – 'The Future You', 24-28 April 2017, Vancouver, BC, Canada. Rabbi Sacks describes himself as a faith leader, philosopher, author, and he is a respected moral leader. "These are the times that try men's souls, and they're trying ours now," began Sacks, quoting Thomas Paine, in an electrifying talk about how we can face the future without fear if we face it together. "It's a fateful moment in history. We've seen divisive elections, divided societies and a growth of extremism – all of it fuelled by anxiety, uncertainty and fear. The world is changing faster than we can bear, and it's looking like it's going to continue changing faster still." Sacks went on to challenge his audience: "Is there something we can do to face the future without fear?" He answered the question by examining what we, early in the 21st century, worship. Future anthropologists, Sacks says, will take a look at the books we read on self-help, at how we talk about politics as a matter of individual rights, and at "our newest religious ritual: the selfie" – and conclude that we worship the self. This worship of the self conflicts directly with our social nature, and with our need for friendship, trust, loyalty and love. As he says: "When we have too much of the 'I' and not enough of the 'we,' we find ourselves vulnerable, fearful and alone." What we need to do, he says, is to strengthen the future "us" in three dimensions: the "us of relationship," the "us of responsibility" and the "us of identity." And above all we need to embrace otherness, to celebrate and respect difference. In an age when narrowcasting, not broadcasting, dominates, and when we surround ourselves only with the ideas we feel comfortable with, our relationship with others suffers. "We need to renew those face-to-face encounters with the people not like us in order to realize that we can disagree strongly and still stay friends," Sacks says. "In those encounters, we discover that the people not like us are just people, like us." Sacks eloquently and humorously moves on to immigration and immigrants; if one has a strong sense of one's own identity one doesn't feel threatened by that of others and so the stranger can be welcomed, not feared. Finally, the "us of responsibility": Sacks finds that we've fallen into "magical thinking", when we believe that electing a particular strong leader will solve all of our problems. When this kind of thinking dominates, we fall for extremism – of the far right or far left, the extreme religious or extreme anti-religious. "The only people that will save us from ourselves is we, the people – all of us together," Sacks says. "When we move from the politics of 'me' to the politics of 'all of us together,' we rediscover those beautiful, counter-intuitive truths: that a nation is strong when it cares for the weak, that it becomes rich when it cares for the poor, and it becomes invulnerable when it cares about the vulnerable. That is what makes great nations." Sacks leaves us with a simple suggestion: "Do a search-and-replace operation on the text of your mind. Wherever you encounter the word 'self,' substitute the word 'other.' Instead of self-help, other-help. Instead of self-esteem, other-esteem. We can face any future without fear so long as we know that we won't face it alone." In the aftermath of Hurricane Harvey, the most devastating storm ever to strike the continental United States, "Now is exactly the time to talk about climate change, and all the other systemic injustices — from racial profiling to economic austerity — that turn disasters like Harvey into human catastrophes," writes author and activist Naomi Klein [dated 28August 2017 before hurricane Irma]. Most media coverage of the disaster has focused on the unprecedented levels of rainfall produced by the storm, Klein says in an article for The Intercept news website. And that because no one saw it coming, no one could adequately prepare. "What you will hear very little about is why these kind of unprecedented, record-breaking weather events are happening with such regularity that 'record-breaking' has become a meteorological cliché. In other words, you won't hear much, if any, talk about climate change. "This, we are told, is out of a desire not to 'politicize' a still unfolding human tragedy, which is an understandable impulse. But here's the thing: every time we act as if an unprecedented weather event is hitting us out of the blue, as some sort of Act of God that no one foresaw, reporters are making a highly political decision. It's a decision to spare feelings and avoid controversy at the expense of telling the truth, however difficult. Because the truth is that these events have long been predicted by climate scientists. Warmer oceans throw up more powerful storms. Higher sea levels mean those storms surge into places they never reached before. Hotter weather leads to extremes of precipitation: long dry periods interrupted by massive snow or rain dumps, rather than the steadier predictable patterns most of us grew up with." The truth is that these events have long been predicted by climate scientists. Warmer oceans throw up more powerful storms. Higher sea levels mean those storms surge into places they never reached before. Under ideal circumstances, Klein says, after the immediate emergency had passed, there would be a thoughtful public debate about the policy implications of the storm in terms of infrastructure, energy sources, and an improved social safety net needed to help the society's most vulnerable people – including the poor, sick and elderly – living in increasingly precarious situations. And perhaps even a discussion about the clear links between climate disruption and migration, and the role of US policies in worsening the problem. "…Which means there is a moral imperative for informed, caring people to name the real root causes behind this crisis — connecting the dots between climate pollution, systemic racism, underfunding of social services, and overfunding of police. We also need to seize the moment to lay out intersectional solutions, ones that dramatically lower emissions while battling all forms of inequality and injustice. "And it has to happen right now – precisely when the enormous human and economic costs of inaction are on full public display. If we fail, if we hesitate out of some misguided idea of what is and is not appropriate during a crisis, it leaves the door wide open for ruthless actors to exploit this disaster for predictable and nefarious ends." Klein concludes: "Talking honestly about what is fueling this era of serial disasters – even while they're playing out in real time – isn't disrespectful to the people on the front lines. In fact, it is the only way to truly honor their losses, and our last hope for preventing a future littered with countless more victims." In the present climate of accusation and counter-accusation, fake news and fact-checking, the media is being scrutinized as never before. For democracy to work factual information and unimpeded, unbiased access to it, is essential. It is truth on which democracy, justice, good governance, in short, all the pillars of a civilized society depend. In an ideal world the media should be free of bias, manipulation and commercial pressure. For democracy to work citizens need to be free to make decisions and to formulate critically and maturely their views about the events and ideas of the time. Few would disagree that in a democracy, those responsible for conveying information – the media – should be free. But currently many seem to confuse the concept of a free press with the free-market press! Free market competition within the media has led to international monopolies – the accumulation of most television, radio, magazines and other periodicals concessions in the hands of the most powerful and richest groups. In Brazil, in 2013, 70 per cent of the press was controlled by just six families, often allied with regional political elites, powerful economic and gigantic religious conglomerates, whose interests run absolutely counter to the needs and interests of the average person. In another developing country, Mexico, the Televisa group owns 70 per cent of the television advertising market. In the developed world, media monopolies abound. In 2013 in Australia 60 per cent of the print press was controlled by Rupert Murdoch, whose extensive media holdings in the US include the powerful television channel, Fox News, and the Wall Street Journal newspaper." In 2012, 10 of the world's 13 largest media groups were in the US. Free market competition within the media has led to international monopolies – the accumulation of most television, radio, magazines and other periodicals concessions in the hands of the most powerful and richest groups. Historically, the attitude of most states was of connivance and complacency about the concentration of so much power in the hands of a few media groups. Dominated by the interests of markets, many countries have allowed the production and access of information to be linked to the interests of the most powerful one per cent of the population. This relationship between media and economic power raises the question: is the media capable of impartiality, considering the interests of their sponsors? In many cases, unfortunately, the answer seems to be 'no'. Once again Brazil is a case in point: researchers have highlighted media bias in reporting attacks on the rural and landless poor, many of whom are activists for land reform and poverty relief. Reports of the murders of such activists seldom if ever make the headlines in the mainstream media in the country. Brazil's main media is controlled by landowners, often the biggest cattle ranchers in the country. Small wonder then that they are diametrically opposed to the national Land Reform policy and other poverty relief policies proposed by the rural poor. Such conflicts gave rise to new ways to organize the media: the basic aim being to reclaim the media as a source of reliable information, promoting critical thinking and challenge the spreading of free market values. Community communication is developing as one of the main ways to challenge a lack of impartiality and influence in the media. Growing out of grassroots movements, NGOs and labor unions, its main aim is to give ordinary people a more active role in the choice and creation of news. It has now expanded to represent larger sections of the population with common interests – for instance in education and the arts – and to support other forms of media. This is an increasingly thriving network that is giving ordinary people a more active role in the choice and creation of news. Community-based projects need the protection provided by media laws to allow decentralization and the democratization of radio, television and other media concessions to flourish. Media monopolies are contrary to the fundamental principles of a democracy, as they tend to hinder or exclude the participation of the less economically powerful in society. To solve this problem, some countries have recently proposed an overhaul of their media laws, so that more groups, including social movements and non-profit associations, are properly and fairly represented. One of the most comprehensive and interesting examples of this new type of legislation is the well-known Argentine Ley de Medios (Media Law), approved in 2009, and established as fully constitutional by its Supreme Court in 2013. Ley de Mediosis in line with the most modern guidelines for the promotion and respect of cultural diversity, such as those established by the UNESCO Convention on the Protection and Promotion of the Diversity of Cultural Expressions and the Declaration of Principles on Freedom of Expression of the Organization of the American States. The Ley de Medios created a series of regulatory bodies for the media, such as the Federal Authority of Audiovisual Communication Services, which is the highest authority responsible for the implementation of the new media law; the Federal Council of Audiovisual Communication; and the Advisory Council for Audiovisual Communication and Children, among others. These bodies are composed of members of the Executive branch of the government, the Congress and civil society, and are primarily responsible for putting the law into practice. Perhaps the most interesting aspect of the Ley de Medios is the imposition of a limit on the number of media outlets any particular commercial group can have. This relates to the possession of different types of media vehicles in the same region (for example, a communications company that has a newspaper and a radio in the same region). The law also establishes other kinds of limits at the national and local level. Nationally, the law limits the number of licences for satellite communication. On the local level, media companies are entitled to just one AM radio license, one FM radio license and one open or subscription television license. As a consequence, the media has been opened up and democratized allowing airtime, print or online space for others. Finally, it is noteworthy that, although the more conservative sectors are critical, in Latin America as a whole the Ley deMedios has been acceptedas an international point of legal reference for new Media Laws around the world. Experts and the United Nations itself have praised the Ley deMedios. Special rapporteur for Freedom of Expression and Opinion, Frank La Rue, said: "Argentina has an advanced law. It is a model for the entire continent and for other regions of the world." In 2007, 9-year-old Felix Finkbeiner was online doing research for a fourth-grade school assignment on the topic of climate change when he learned of Wangari Maathai, a Kenyan woman whose efforts to recover barren land resulted in the planting of 30 million trees, for which she was awarded the Nobel Prize in 2004. Deeply inspired, Finkbeiner had a vision… Considering that each tree binds a CO2 intake of 10kg per year, if children around the world could plant one million trees in every country on earth, they could offset CO2 emissions all on their own. The then 13-year old Felix Finkbeiner speaking at the United Nations. Felix Finkbeiner's teacher was impressed by his presentation and asked him to give it again to other students and the headmaster. At the close of his talk, he pledged to plant one million trees in Germany. A movement was born. Two months later, Finkbeiner planted his first tree, a crab apple, near the entrance to his school. Klaus Töpfer, former German Federal Minister of the Environment and executive director of the United Nations Environment Programme (UNEP), then became his official patron, and at the age of 10, Finkbeiner became a UNEP Junior Board Member. He was invited to speak at important environment and climate events, as well as to the European Parliament. Finkbeiner established Plant-for-the-Planet academies in Germany and around the world; events organized by children for children, where they become active Climate Justice Ambassadors, pass on their knowledge and encourage other children to take on social responsibility and shape their future. In 2009, at UNEP's children and youth conference in South Korea, 800 children adopted a declaration for the climate summit in Copenhagen. Finkbeiner asked the audience who else among them would be willing to plant one million trees in their own country? Minutes later, hundreds of children from 56 different nations came onto the stage to signal their support for the vision of Plant-for-the-Planet. In 2010, Germany planted its millionth tree, and a year later, at the age of 13, Finkbeiner delivered a speech at the UN in New York. The UN also turned over stewardship of its Billion Tree campaign to his organization. Today, more than 63,000 children between the ages of 9-12 are afflilated with Felix Finkbeiner's organization, fighting for their future as Ambassadors for Climate Justice. To assess if their efforts were keeping up with continuing deforestation around the world, the group commissioned a study, published in Nature in 2015 which found that Earth has 3 trillion trees – seven times the number previously estimated. It also discovered that since the dawn of agriculture 12,000 years ago, the world's tree population has fallen by nearly half and that approximately 10 billion trees die every year. This implies that a billion new trees is not enough. Plant-for-the-Planet now aims to plant one trillion trees by the year 2020. These are expected to absorb an additional 10 billion tons of carbon dioxide every year – buying time for the world to get serious about reducing carbon emissions. On 2 July 2017 volunteers in India planted more than 66 million trees in just 12 hours in a record-breaking environmental project organized by the Madhya Pradesh state government. 1.5 million volunteers of all ages planted 20 different species of trees along the Narmada river basin, chosen as the best site to increase the saplings' chances of survival. India is the world's third largest generator of carbon emissions and is committed under the Paris Climate Agreement to increasing its forests by five million hectares before 2030 to combat climate change. At a joint press conference with French President Emmanuel Macron in June 2017, India's Prime Minister Narendra Modi reaffirmed his country's commitment to the Paris climate accord after the US withdrew from the deal, when he said: "The protection of the environment and the mother planet is an article of faith." In August 2017 Pakistan's Billion Tree Tsunami Project was completed in the north-west province of Khyber Pakhtunkhwa. The idea for the project came from cricketer and politician Imran Khan, who wanted to restore the province's forests after decades of widespread felling, which left the region increasingly vulnerable to flooding and landslides. In April 2016, heavy rain led to flash floods killing at least 71 people. Khan explained: "One of the biggest reasons glaciers are melting in the mountains is because there has been massive deforestation, so this billion trees project is very significant for our future." As trees absorb carbon dioxide from the atmosphere, it is hoped that the project will also help to slow down climate change. Pakistan is extremely vulnerable to the increased risk of natural disasters and in the 2017 Global Climate Risk Index was ranked in the top 10 countries most likely to be affected by long-term changes. The Billion Tree Tsunami was successfully completed four months ahead of schedule, and is now due to be replicated across Pakistan.